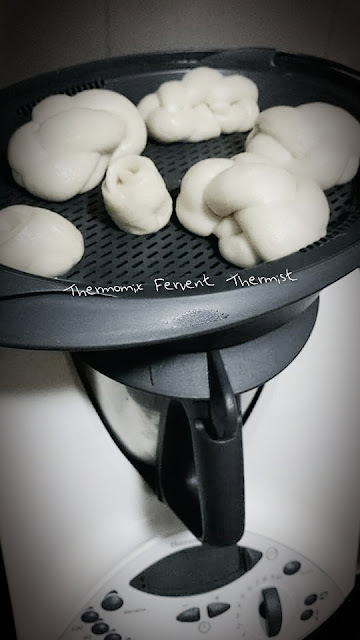 Went Singapore last weekend, me had a great time together with my little niece, guided her to learn how to use her dad's TM31, and learnt to make her favourite steamed bread - plaited mantou. 3) shape the mantou, (wrap with filling) leave them in Varoma dish for proving half an hour or double in size ( time Varied according to yeast's activeness ) Remember to keep them in a warm place, or cover with a piece of cloth. 4) After 30 min or when mantou dough double in size. Put in water, stack Varoma in position, to steam. Usually I keep mantou in freezer, steam it for my son in the early morning whenever needed. Just add 200g water in TM bowl, insert simmering basket, toss in 4 frozen mantous, steam for 4 minutes. *the duration of steaming depends very much on the weather, if it is a cold day, it might take another minute longer.